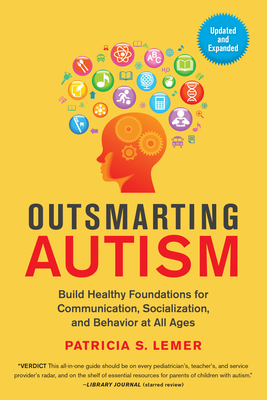 The Doylestown Bookshop welcomes author Patricia Lemer for a book signing for her book, Outsmarting Autism, on April 23rd at 6:30pm. Newly revised and updated, this user-friendly guide addresses autism identification, treatment, and prevention from pre-conception through adulthood. Outsmarting Autism describes more than 50 practical approaches with proven efficacy, including lifestyle modification, dietary considerations, and boosting the immune system. After health improves, focus turns to developing the sensory foundations for communication, social skills, and learning. Patricia Lemer's approach is grounded in research on multifactorial causes, or "Total Load Theory," which explains that developmental delays are caused not by one single factor, but by an overload of environmental stressors on genetically vulnerable individuals. Patricia S. Lemer is a licensed professional counselor, holding a Masters of Education in counseling and learning disabilities from Boston College and a Masters in Business from Johns Hopkins University. She practiced as an educational diagnostician for over 40 years. She was a co-founder and served as Executive Director of the international non-profit organization Developmental Delay Resources. Lemer writes continually for her blog "After the Diagnosis, Then What?" about combining a biomedical approach to autism with sensory and movement-based therapies. She is the editor of EnVISIONing a Bright Future: Interventions that Work for Children and Adults with Autism Spectrum Disorders (2008), and the author of Outsmarting Autism: The Ultimate Guide to Management, Healing, and Prevention (2014). The latter won First Prize from The Authors' Zone (TAZ) in 2015. From 2012-2014, Lemer consulted in Kuwait to establish a center for young adults with autism. She lives in Pittsburgh, PA and is both a mother and grandmother. All event-related inquiries can be sent to our Director of Programming/Publicist, Krisy Elisii, at krisyparedes@gmail.com.